Plants For Fit Instagram Page: When I tell you I love something I really mean it! And I love this Instagram page! This page offers tons of health information and advice. They also offer different vegan recipes and meal plans. I have reached out multiple times and they are very responsive to messages if you have any questions. They have tons of photoshopped images from anything like “A full day od eating vegan” to “Foods to boost your mood”. If your on Instagram I would definitely check this page out and follow them! Homemade Zucchini Brownies: I recently found this zucchini brownie recipe and I am in heaven! I’ve made then twice already in the past two weeks and I cannot get enough of them. They are super rich and moist, and with 2 cups of zucchini in them! I love that they are low calorie so you don’t have to feel ashamed for eating half a pan 🙂 These are definitely worth making! Forks Over Knives Meal Planner: This week I’m doing a trial of the Forks Over Knives Meal Planner. I’ve tried a few recipes so far and they have all been delicious. I would say the recipes they provide are pretty straight forward, and not very time consuming. Last night I made their peanut noodle recipe and it was amazing! It had grated ginger and chopped garlic, maple syrup and soy sauce and of course peanut butter. The recipe even called for frozen mixed vegetables which I was surprised but very happy about! I love that they break the steps down and add comments for support. They also provide a grocery list which is awesome. I would say this could be useful for someone with a tight schedule and an interest in making healthier meals. 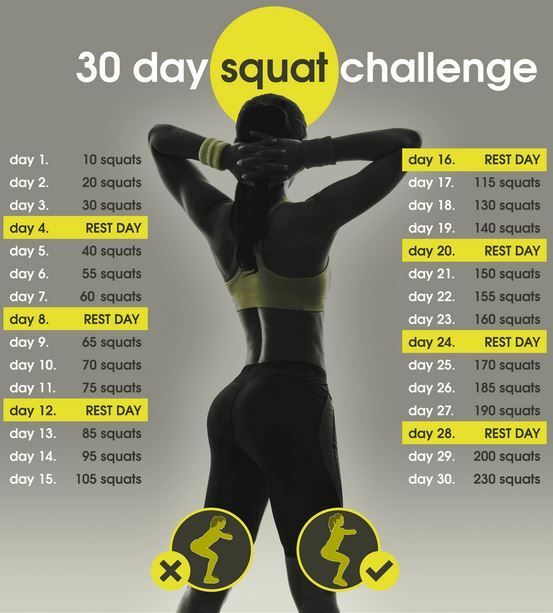 Squats Challenge: So I decided to start a squats challenge on my health page. Currently I’m the only one doing it but that’s okay 😉 I made it to day #15 yesterday and I am so sore today. I can actually feel the muscles in my legs tensing up as I think about doing more squats tomorrow. The trick to fitting in so many squats in a day is to do 10-20 squats at a time throughout the day. For example, when I wake up in the morning I do some, when I use the bathroom at work, then when I get home and before bed to finish off. To keep track I use the calculator in my phone and just subtract the number of squats I accomplished from the total goal that day. I’m half way finished and I can’t wait to find a new challenge! I hope you too can benefit from these things as much as I have been this past week! What things are inspiring you to stay healthy and in shape?